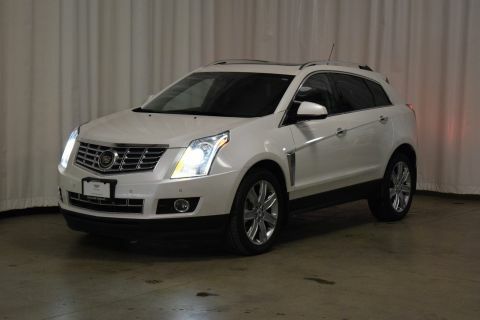 This Cadillac SRX has a strong Gas V6 3.6L/217 engine powering this Automatic transmission. WOOD TRIM includes Raven Sapele wood on steering wheel (heated) and shift knob, WOOD TRIM includes Raven Sapele wood on door and center stack. Includes (34G) Wood Trim., WHEELS, 20 X 8 (50.8 CM X 20.3 CM) POLISHED. TRANSMISSION, 6-SPEED AUTOMATIC, AWD, 6T70 with tap-up/tap-down (on shifter), performance shifting and manual-up/manual-down (STD), SEATS, FRONT BUCKET includes 8-way power driver seat adjuster (STD), PREMIUM COLLECTION PREFERRED EQUIPMENT GROUP Includes Standard Equipment, LPO, MOLDED SPLASH GUARDS, LIGHT TITANIUM W/EBONY ACCENTS, LEATHER SEATING SURFACES, LICENSE PLATE BRACKET, FRONT, ENGINE, 3.6L SIDI DOHC V6 VVT (308 hp [229.7 kW] @ 6800 rpm, 265 lb-ft of torque [357.8 N-m] @ 2400 rpm) (STD), BLACK RAVEN, AUDIO SYSTEM, AM/FM STEREO, SINGLE DISC CD PLAYER USB port and auxiliary jack (STD), Wipers, Rainsense, Windows, power front express-up and down, rear express-down and remote express down feature for all windows, Wheels, 20 x 8 (50.8 cm x 20.3 cm) bright machined finish with premium painted accents (Upgradeable to (RTU) 20 polished wheels, (SLV) 20 Midnight Silver premium painted finish wheels or (SLW) 20 7-spoke Manoogian Silver premium painted finish wheels. 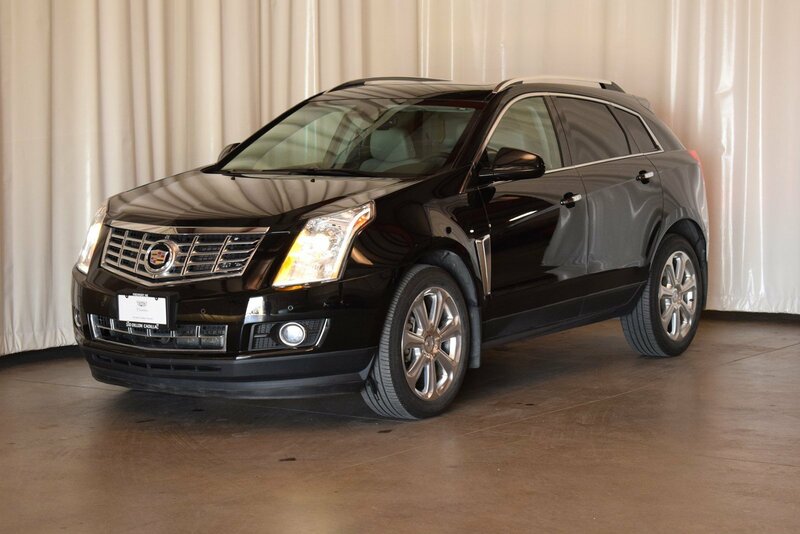 ), Visors, driver and front passenger illuminated vanity mirrors, Universal Home Remote includes garage door opener, 3-channel programmable, Transmission, 6-speed automatic, AWD, 6T70 with tap-up/tap-down (on shifter), performance shifting and manual-up/manual-down. 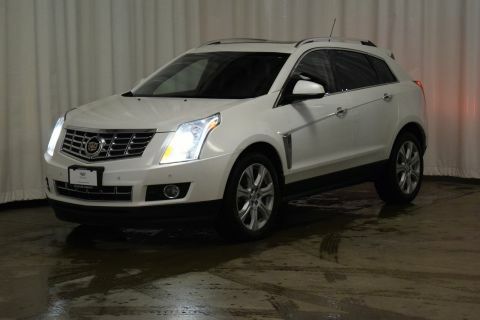 As reported by KBB.com: If you're in the market for 5-passenger luxury crossover-SUV with expressive styling, cutting-edge high-tech infotainment and a powerful standard engine, the 2015 Cadillac SRX warrants a test drive. 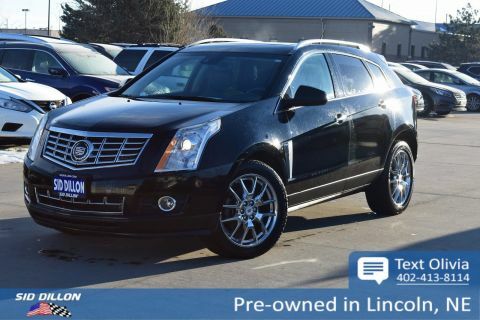 Come in for a quick visit at Sid Dillon Fremont Buick GMC Cadillac, 2420 E. 23rd Street, Fremont, NE 68025 to claim your Cadillac SRX!